In this paper, we demonstrate the viability of shared three-dimensional virtual environments as an experimental platform for conducting crowd experiments with real people. In particular, we show that crowds of real human subjects moving and interacting in an immersive three-dimensional virtual environment exhibit typical patterns of real crowds as observed in real-life crowded situations. These include the manifestation of social conventions and the emergence of self-organized patterns during egress scenarios. 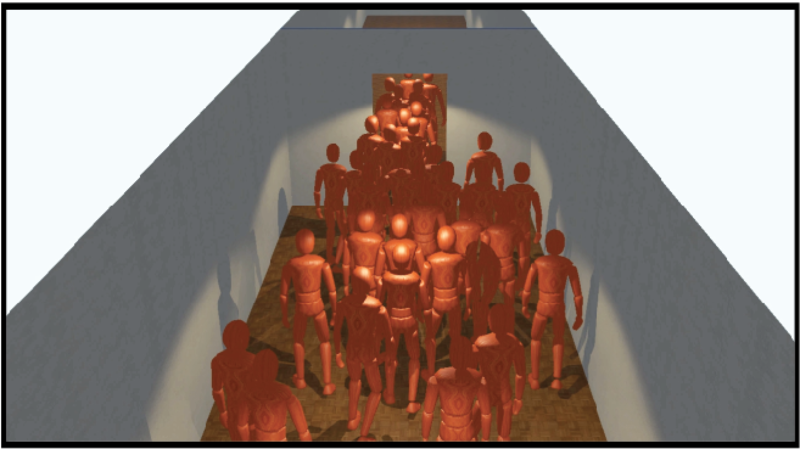 High-stress evacuation experiments conducted in this virtual environment reveal movements characterized by mass herding and dangerous overcrowding as they occur in crowd disasters. We describe the behavioural mechanisms at play under such extreme conditions and identify critical zones where overcrowding may occur. Furthermore, we show that herding spontaneously emerges from a density effect without the need to assume an increase of the individual tendency to imitate peers. Our experiments reveal the promise of immersive virtual environments as an ethical, cost-efficient, yet accurate platform for exploring crowd behaviour in high-risk situations with real human subjects.